2018 has been a busy year for Biotecture Planet Earth. From all of us at Biotecture Planet Earth, we would like to send gratitude and a big THANK YOU to all those who have made these achievements possible; we would have not been able to do any of these projects had it not been for the incredible support we received from donors, volunteers, crew and kind entrepreneurs who believed in us from the very beginning. This is a summary of what we all have been able to achieve together, as one big family. We hope to achieve much more in 2019. After Puerto Rico was hit by Hurricane Maria in September 2017, we rapidly started organizing a first trip there to assist in rebuilding the devastated island with self-sustaining buildings alongside local Puerto Rico residents. In February, a first group of crew and volunteers headed to Puerto Rico for a week and built the first structure of a future disaster relief and redevelopment educational center that will be open to the public as a meeting point for all those that wish to learn about sustainable building in order to be able to replicate it where needed. The build brought together 100 people from all over the world and a first structure was completed with a second one started. Back home, preparations were coming along for the Zuni project. Managing a project starts months before the actual build and includes budgeting, promotion, fundraising and starting to source materials and tools for the construction of the building. As soon as the first Puerto Rico project was over, we started prepping for the second one in June. We also started preparing for the Zuni project. Both of these projects were scheduled for end of June, with the added challenge of organizing two projects at the same time. 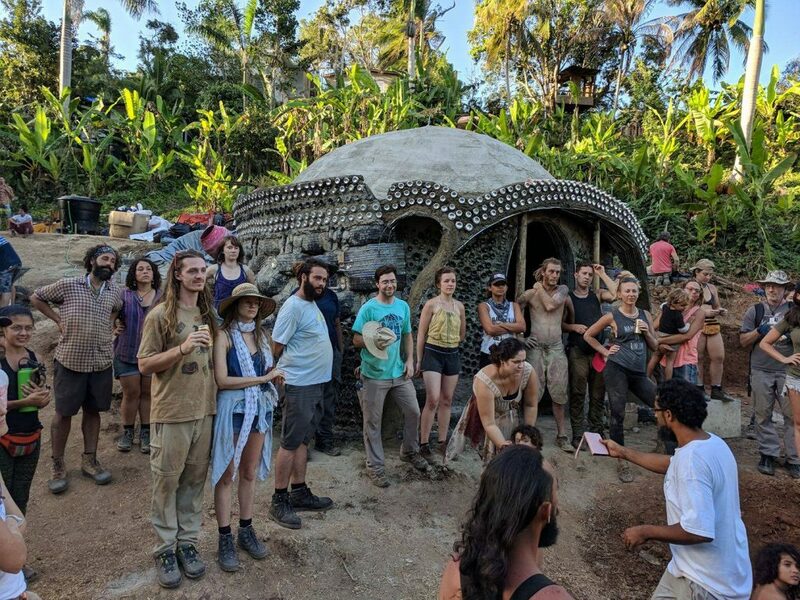 By mid June, both projects were ready to happen with two great Earthship and local crews and two amazing groups of volunteers that donated their time and funds to make these projects happen. Once again, we were able to count on the incredible kindness of a big group of people who donated towards both projects enabling us to do what we do. 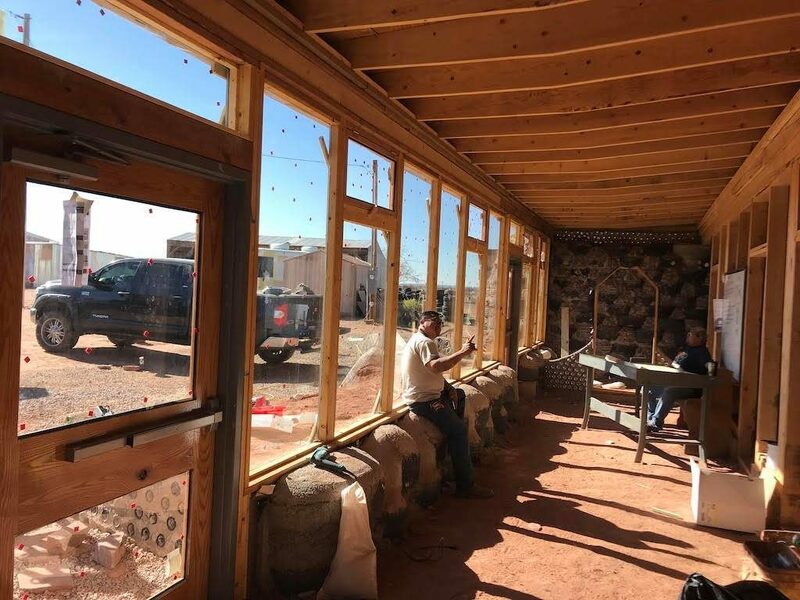 The Zuni project, in cooperation with the Zuni Environmental Protection Program, entailed the construction of a self-sustaining veterinary clinic to improve the animal – human relationship in the Zuni territory and be able to provide a veterinary service all year around. The team was able to construct the building’s walls, roof and greenhouse framing in the three weeks the build lasted. Puerto Rico PHASE 2 took place between the 20th and 30th June 2018. The objectives were to start the third hut and start implementing the systems for the existing buildings in the compound. The Earthship and Biotecture Planet Earth crews were as usual joined by a fantastic group of international and local volunteers who gave everything they had to this project. Puerto Rico Phase 2 was made possible only by individual donations, no government funding or corporate sponsorships were received towards this project. The summer months were spent with some more strategic and planning work by the core team in Taos, New Mexico. Biotecture Planet Earth is a small non-profit organization with no regular source of income and with a voluntary Board of Directors. A lot of time goes into planning and promoting upcoming projects and finding the funds to make them happen. Research is an essential part of what we do. We also started planning for Phase 3 of our Puerto Rico project scheduled for January 2019 with a donation goal of $25,000 that we reached in the last days of December! We are looking forward to being able to report on the results in January. Once again, thank you very much to everyone that made a difference to these projects and that make it possible every day for us to continue working towards our goals of making this world a more sustainable place to live in. We look forward to this new year of projects and continuing our work.